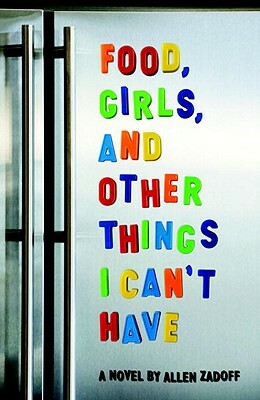 Food, Girls, and Other Things I Can't Have by Allen Zadoff. Grades 9+ Egmont USA, 2009. 311 pages. Reviewed from purchased copy. Andy Zansky is fat. He's also super smart and funny and kind and caring, but the kids at his high school just see the fat. And Andy's not okay with that, exactly, but he knows that's the way things are... until he meets (and immediately falls in love with) new girl April. Something has to change because he can't let April be one of those people who only see his mass. After a chance encounter with the school's golden boy, quarterback O. Douglas, Andy decides to go out for football. And everything will change. This book waited for WAY TOO LONG on my to-be-read shelf and once I started it I didn't really put it down until I was done with it. Short chapters and a funny, relateable main character kept me turning the pages and I think those are exactly what gives this book teen appeal. Food, Girls, and Other Things I Can't Have is a book about the way that people see you. Even though Andy has a lot of good qualities, a lot of the kids at his school can't see past the surface. I'd say that Andy can't really see through the surface either. He is what he's always been - a nerd, unpopular, nonathletic. That's what he sees reflected back at him from the kids at school and from his family, so Andy makes choices that don't rock the boat. He participates in Model UN. He doesn't really talk to girls. He puts up with the bullies as best he can. When a chance encounter with one of the most popular guys in school leads to Andy trying out for football, everything begins to change. Andy begins to see himself differently and his choices reflect that. So, this is a story about the way the people might see you and how you let that affect your life. It's also a great sports story. The sports and the humor are things that might appeal to you guy readers (and girl readers, too, of course). But really this is a story that a lot of kids can relate to and it deserves to find a wide audience. Food, Girls, and Other Things I Can't Have is on shelves now, so don't let it fly under your radar!